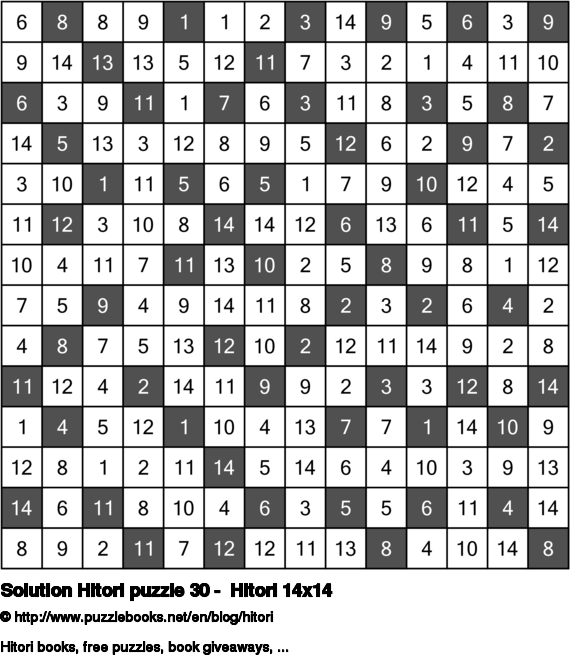 Click here to view the solution for Hitori puzzle 30 - Hitori 14x14. I hope you managed to solve it and had a lot of fun trying to do so. Hitori puzzles are logic puzzles that are an ideal brain training. How to play Hitori: The goal of Hitori is to paint out some cells so that there are no duplicate numbers in any row or column. You can only connect black cells diagonally and you must connect all the white cells horizontally or vertically in a single group. 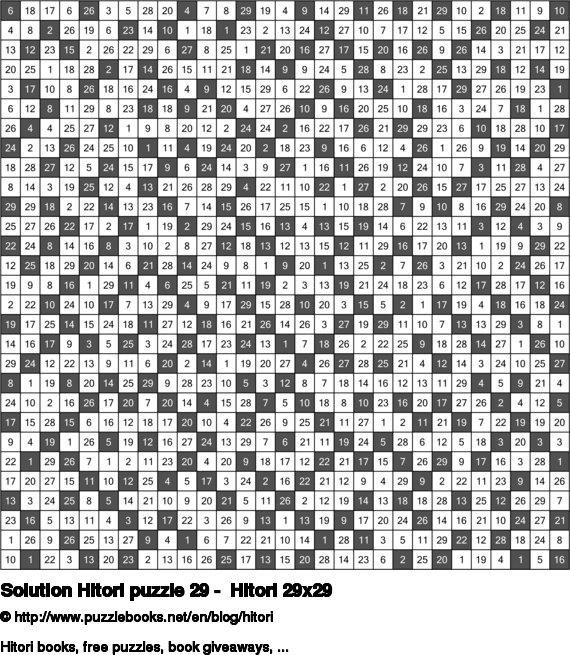 Click here to view the solution for Hitori puzzle 29 - Hitori 29x29. I hope you managed to solve it and had a lot of fun trying to do so. Hitori puzzles are really fun brain games. This logic puzzle will give your brain a great exercise. 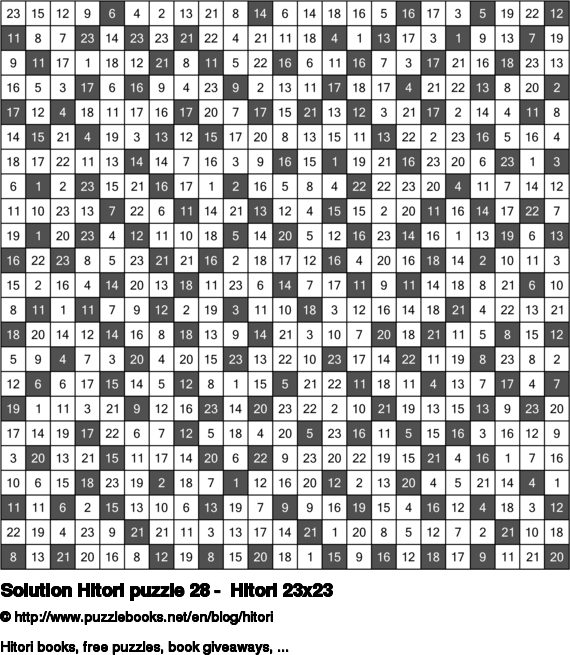 Click here to view the solution for Hitori puzzle 28 - Hitori 23x23. I hope you managed to solve it and had a lot of fun trying to do so. Is solving Hitori puzzles a passion for you? You will most certainly enjoy today's Hitori puzzle. 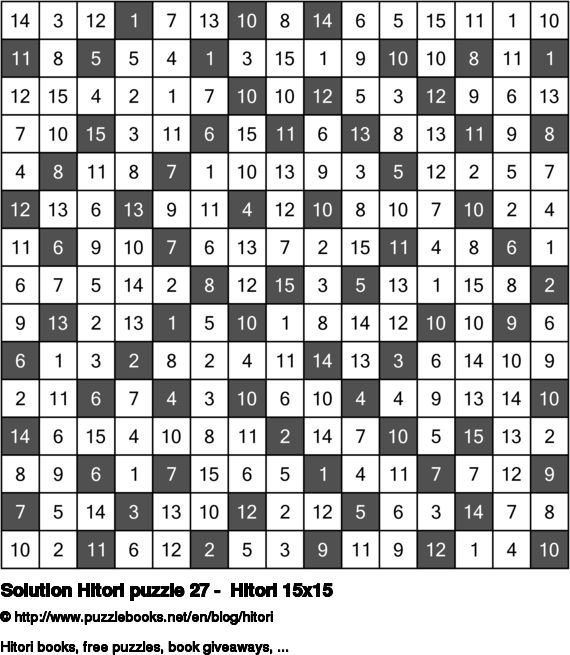 Click here to view the solution for Hitori puzzle 27 - Hitori 15x15. I hope you managed to solve it and had a lot of fun trying to do so. I really love solving this Hitori puzzle. I hope you have as much fun trying to solve it as I did. 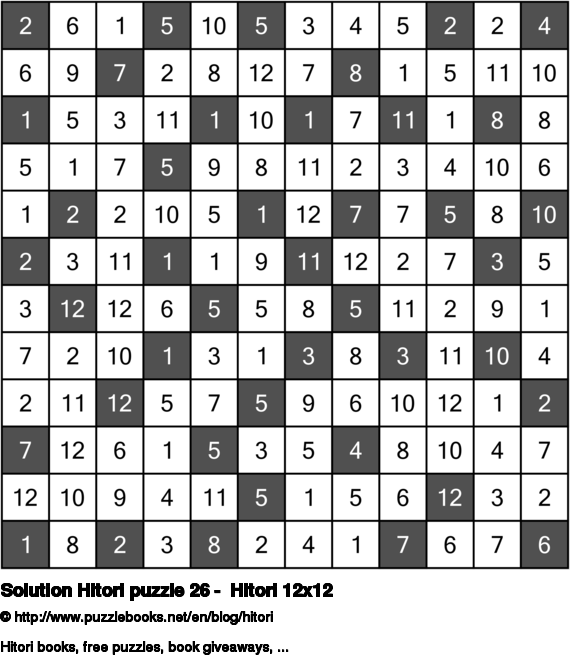 Click here to view the solution for Hitori puzzle 26 - Hitori 12x12. I hope you managed to solve it and had a lot of fun trying to do so. Try this week's Hitori puzzle. It is ideal for children to learn how to solve Hitori puzzle.